Traffic and Parking Signs are available for use in crosswalk areas, parking lots, side streets, private streets and even school zones. Street Signs, Stop Signs, and Speed Limit Signs are also available for added safety on any public or private road. Custom Signs can be created for unique traffic and parking messages. Choosing a Traffic or Parking Sign at Seton is easy. That's because Seton has a large selection of traffic & parking signs, divided into 13 categories for easy shopping. 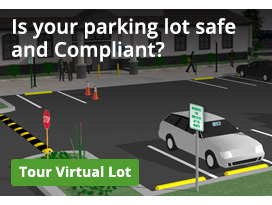 If your business or facility has a parking lot or roads within your property, traffic & parking signs are extremely important for safe and efficient traffic and pedestrian flow. Choose from crosswalk signs, guide posts and signs, no parking signs, various parking lot signs, school zone signs, speed limit signs, stop signs, street signs and more. Plus, Seton carries a nice assortment of posts, stencils, hardware and other accessories to make the installation and placement of traffic & parking signs safe and easy. If the roads and parking lot around your facility, office or small business is in need of top-quality traffic signs, parking signs, or some combination of the two, check out Seton.